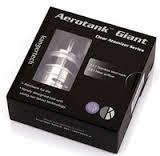 Kanger Giant Aerotank Glassomizer. Adjustable air flow, 4.5 ml capacity Comes with 2- 2 Ohm (dual)Coils. Only Pro Tank 3 coils are compatible.